Find the perfect teacher or instructor in Victoria for private cello lessons in your home or in their studio. Check out some of our most popular teachers near Victoria including Riverside, Corona, Fontana, Redlands and Apple Valley. Student needs to have the instrument. I usually use Essential Elements and Suzuki books for beginner and intermediate students. Also String Tunes. I am experienced (3 years) in home school tutoring. I mostly work with Florida Virtual School students. I overlook their tests and assignments, and help them with preparations for Discussion Based Assessmemts (DBA). I also help parents with required annual evaluations and how to sign up with home education department. For my tutoring sessions I use skills that include goal-directedness, I teach how to organize learning in small steps and how to set them up; I always strive to motivate and engage my students to make them interested in learning and have fun; I also use self-control skills to teach how to avoid distractions and I show how to use different focusing strategies. I use positive mind set skills to teach how to use failures as learning opportunities. um and Education; and Masters in Arts (2012) in Teaching English to speakers of other languages, and Bachelors in Music Education (2010), both from Florida Atlantic University, as well as a degree in violin performance from Chicago. I studied piano in Chicago for 10 years & taught both piano & violin for over 20 years. I also teach flute & cello for the past 5 years, as I studied them during my Music Education program. I have taught music for over 24 years using the traditional and Suzuki methods. I am fan of the Essential Elements method and I Can Read Music book for string instruments, and the Alfred's Piano Library for piano. Alfred's piano library can be used for any age as they also have books especially made for adult learners. I also like their music flash cards. For teaching music theory I mostly used Fundamentals of Piano Theory (9 levels) combined with Master Theory (6 levels) books. I personalize every lesson, and always set goals for my students. Most of my violin students are members of the Florida Youth Orchestra as well as the Gold Coast Youth Orchestra and my piano students participate in Pompano Beach Piano competition and the annual Piano Guild auditions. I teach any age and any level, and always stress that learning a new instrument is very similar to learning a new language, it needs a lot of patience, persistence and repetitions. My lessons are customized to my students needs, and are work in progress as they needs may change over time. I always remind my students that music can give them instant gratification when they learn to play favorite songs. I always encourage my students to tell me about their music preferences, so I can incorporate them in their music lessons. All my tutoring sessions include reviews of previously learned material and if possible the use of technology. I use students books but often bring extra study materials if necessary. All my lessons include technique and reading music. I like to use the Finger Power for piano students and Essential Elements for my string students, and scales for both. Music theory: I use Master Theory and Fundamentals of Piano Theory books for younger ages, Alfred's music flash cards to support learning notes and musical terminology, and of course the fun part performance. Besides Essential Elements for strings I also use String Tunes and I Can Read Music to add more fun to the lessons as well as support reading music during the lesson. For piano students I use Holiday Treats book, which comes in 2 different levels: Beginner & Intermediate, so my students have a new songs for a specific holiday. I always bring violin with me to be able to show what I teach. The students need to have their books and assigned material ready for tutoring. Instrumental students needs to have their music books, flashcards & instrument available as well as a pencil. I always stress with my students to be organized and prepared for their lesson, this way they will be able to focus better during the lesson. I always bring my violin with me. I also ask that the room where the lesson takes place be free of any distractions, such other siblings or any other noise. The quiet environment helps in faster learning. I tutor most K-12 subjects and prepare students to take ACT, SAT, GRE tests. I'm sorry, I cannot handle this Instructor for my children. She wasn't me but she's not quite the people person I expected. Her personality is not a good match for a high school tutor. Unfortunately her English is not good enough. Her accent is entirely too strong. Also she does not know enough Geometry to help my kids. I've been teaching music for 15 yrs on guitar, piano, bass, cello and bass. My students have ranged from from 5yrs to 75yrs of age. I have seen many student go on to join orchestras, bands, broadway shows or simply continued their education to a university or college. Being able to read music profeciently has given me the opportunity to teach off many method books but like to use Alfred Method, Mel Bay and Frederick Noad Method books. I teach many styles ranging from classical, jazz & blues, rock, contemporary and pop. I do stress and recommend all my students to learn how to read music and usually by our second or third lesson they will playing simple songs. I am here to help you make music! igh and high school I was selected to play for the Junior Pacific Symphony Orchestra, received scholarships to music summer camps, and was selected musician of the year. In college my quest continued with the Orange Coast College Orchestra, Praise Symphony Orchestra, Vanguard University Orchestra as well as guitar ensembles and college choir groups. I've also taken private lessons from Dr. Art David (Julliard graduate) in stand up bass as well as David Black (Pacific Symphony Orchestra) and classical guitar with Richard Glenn and David Murray. I've been teaching now for 15 years in guitar, classical guitar, bass guitar, stand up bass, cello, piano and voice ranging from 5 yr old to 65 yr old. My styles of music range from classical, jazz, rock, blues and contemporary. At this point I'm enjoying playing and singing in my church choir and worship team as well as teaching my two kids the joys of music. I hope you truly enjoy the joy of learning music whether it be through me or another teacher. As a teacher I require all students to set time aside to practice. For without it, it is only wasting your time, your money and my time. I don't expect a total dedication to it but I do want to see some effort put into it. A little practice can go a long way and the more you do it, the faster you will progress and the more you will enjoy it. We will first start off with what you want out of music and the level you are at and go from there. Student can bring their own music either thru tabs, music sheet or just by ear but one thing I do expect is a student to learn how to read music notation. We will go thru the regular warm up exercises, material practiced during the week and any new music for the following week. Correct techniques in how to hold your instrument or voice procedures will be addressed. Music theory will also be part of the lesson as well as ear training. At the end of either 3 to 6 months you will have learned the basics of music and will be playing songs for you or someone else to enjoy. I will make it a total relaxing and enjoyable atmosphere but some dedication has to put on the students' part. I provide my own instrument. I can also provide music stand, small amplifier if needed and music material for the first few lesson until student provides for him/her self. Student must have own instrument. My way of teaching would have to be that they must learn how to read music while learning how to play an instrument. First lesson was more of an assessment of where I am as a musician, it was a good lesson but I'm sure the next will be better. Omar is obviously a professional. Hopefully he will be able to teach me how to read music as good as he soon. Omar is on time and and kind at our first meeting. My lesson format encourages quick learning of concepts that include physical movements of cello playing, music theory, history, and general musicianship. The length of the lesson is dependent on the level of repertoire. Beginners take 30 min. lessons while more advanced students need 45 min. or 60 min. lessons. Each lesson is recorded so the student has a reference of what the music sounds like. It speeds up the learning time because the student knows what to do and what not to do. Watching the video is like having a lesson everyday between live lessons. I have had a studio since 2001. I teach all ages and levels of students. I'm very good with beginners. I am very patient and encouraging with my students. I am able to quickly diagnose problems and recommend a solution so the student can progress. I am a member of the American String Teachers Association (ASTA). John is laid-back and comfortable with my son, quickly assessing where to start with him. We were given clear homework and are excited to see where this journey with the cello takes us! Having a positive experience with John teaching our son cello. He works well with children, patient, understanding while setting expectations for the student to reach. John is very patient, organized and structured. He has definite lesson plans. It makes it easier for my child to understand his instrument and learn it. I am very happy to have found him for my son. ----Thank you John! I am an emotive cellist with two decades experience. As a member of the Park Quartet (the quartet in residence at Park Church) I recently performed at the 100th anniversary of McGolrick Park. I love sharing classical music with all levels of students. Lessons with me are calm, meditative experiences where we use Zen techniques to enter into the heart of music. Hello cellists! My name is Lenna and I am pleased to meet you! I've been teaching private lessons since 2011 and have loved helping my students improve their tone, learn better sight reading skills, and become more relaxed around their cellos. I studied chamber music for four years under the world famous Chiara Quartet. My favorite books about classical music are: The Art of Practicing and Just Play Naturally. I'm a kind and patient person and my teaching style is focused on comfort and emotional vibrancy in performance. I look forward to guiding you through some wonderful musical experiences. Lenna is out of this world! When I first undertook, as an adult beginner, to learn the cello, I often found myself frustrated by the challenge. Lenna changed the way I approach my studies. She taught me to FEEL music, to find the beauty in slowing down and repeating, to have patience with my practice and to appreciate my progress. She has improved my rhythm, vibrato, sound quality, knowledge of music theory and more. She is always gentle and supportive during our lessons and approaches learning with a humility I only wish I could have. She likes to end lessons by guiding her students through a few minutes of improv, which I deeply enjoy. A talented cellist (and musician generally); a wonderful instructor; and a kind, supportive, optimistic personality. I love working with Lenna and strongly recommend her. In my lessons, I plan to develop a connection to my students, allow for room to grow and improve as cellists, and to elicit proper playing/performing techniques. Lessons are individualized for every student, as students aren't all equal. Hello, my name is Carly. I'm currently pursuing a bachelor's degree in music education at the University of Louisville. Throughout the past couple of semesters I've been learning many different methods for teaching, privately and publicly. I have 6 students of my own, and would love to expand my studio and take in more cellists. I've been playing cello about 10 years and love to share my passion with others. The most effective way of learning about anything is by actually doing it! Carly is very personable and knowledgeable. From the first lesson she caters the instruction to my needs and interests while building on solid basic techniques and music theory. I’m excited about the goals we’ve set. She is an amazing teacher! She explains things in a way that best fits my perspective. She is understanding and very helpful. I was so happy to see the detail Carly went into teaching me the cello. She made a very comfortable environment to learn. I felt like she was interested in seeing me succeed! Cindy holds two degrees and a teaching Certificate. She obtained her Master of Arts degree from Dallas Baptist University in 2016. In 1996, she received a full music scholarship to Sam Houston State University, where she earned a Bachelor of Music degree in Viola Performance. Mrs. H has 20 years of experience teaching private violin, viola, cello, and piano, as well as 7 years teaching elementary music and orchestra for the public school system. Mrs. H has performed at hundreds of weddings, receptions, and parties with various string quartets, as well as orchestral events and churches all across Texas. I hold bachelor of music and master of arts degrees. I have over 20 years of experience teaching piano, violin, viola, and cello. My favorite part of teaching is instilling the love of music in my students. My first lesson so far with Cindy. She was very patient and understanding and will work with me at my own speed and level. Looking for to my next lesson! Thanks Cindy! Cindy is terrific! Our three kids (2 learning piano and 1 learning viola) really look forward to their music lessons with Cindy. She is on time, courteous, kind, and most of all, she’s patient. Cindy is very patient & attentive to my goals. Looking for teacher who specializing in making cello playing fun? Cello's unique range and it's flexible identity makes cello performing not limited in the classical music but also pop music. Miss L is a experienced teacher of 8 years. Received her Masters degree in cello performance and is currently pursuing a Doctoral degree in cello performance at U.S.C. Miss L is also featured in many local performances by orchestras such as the South Carolina Philharmonic in Columbia SC, the Symphony Orchestra Augusta in Augusta GA.
As a passionate cello player, I want my students to have fun but also really understand their instrument and the music they are playing! Students will learn their scales through the circle of fifths, shifting positions, vibrato techniques, music theory, and performing with an accompanist. They are expected to have fun but to work hard - it’s totally worth it! I have been playing piano for 23 years and cello for 16 years. I love sharing music with others and seeing them grow to love music as well. I am currently a pianist for the KC Ballet’s ROAD program. I have a Bachelors of Music from Lindenwood University. I have been a piano accompanist for 7 years. I taught 5th grade Orchestra Club in the Fort Zumwalt School District and was a substitute teacher for Orchestra classes for 3 years. I have been teaching private lessons for 10 years. Melissa is fantastic!! Extremely kind and very patient. She’s a great teacher!!! As a student of mine you can expect to improve your playing skills week to week. I can teach from the very first lesson on. Students will learn techniques to improve their playing and will play fun music. If you are interested in learning improvisation, I can help with that, too. I enjoy teaching violin, viola and cello. I am most passionate about teaching students to become independent, critical thinking musicians who will be able to rely on their own knowledge to learn new music as they go along. I stress music reading, ear training, and strong fundamentals in playing. I am very encouraging, love spreading my love of music. I began playing violin in elementary school, and immediately knew this was what I wanted to do for the rest of my life. My first words as a baby were lyrics because I sang before I spoke. I played violin until 11th grade when I fell in love with the sound of the viola. I studied music performance and music education in college and I have a bachelors degree in both. I have played professionally in orchestras, quartets, as a soloist, and in many rock and folk settings. I have even put my violin and viola through a distortion pedal and a wah wah pedal in heavy metal/punk music. I have over 17 years of teaching experience and am a licensed teacher in the state of virginia. I have taught in a classroom as well as privately, and have also taught students with autism. to week. I can teach from the very first lesson on. Students will learn techniques to improve their playing and will play fun music. If you are interested in learning improvisation, I can help with that, too. I enjoy teaching violin, viola and cello. 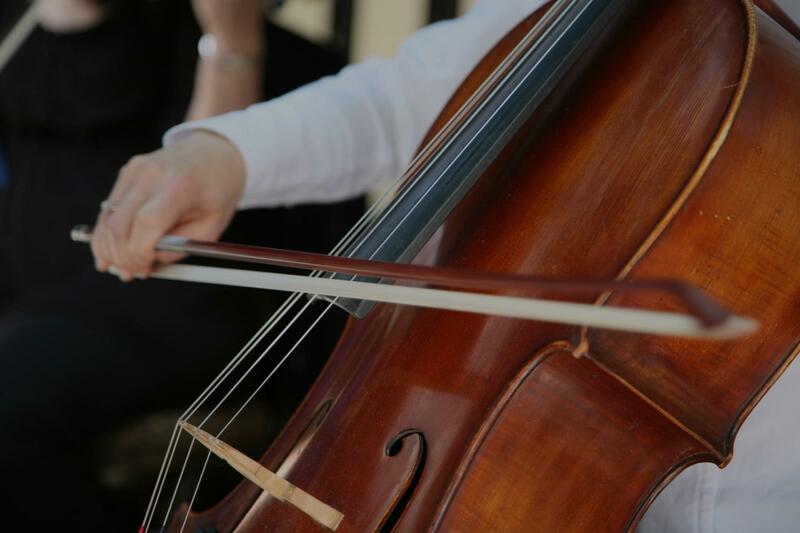 Experienced professional cellist with degrees in music and music education strives to bring a solid foundation combined with the joy of music. My passion is music and my greatest joy is sharing that passion. My teaching style is adapted to each student, customized lesson plans and curriculum designed to teach and challenge but also ensure the student is enjoying the experience by basing lessons on music in which the student is interested or related to their other interests and activities. I’ve been studying and performing since I was four years old and it’s always my great pleasure to share the love of music! Students are raving about their Cello instructors on TakeLessons. Check out some of these recent reviews. "Susan is so encouraging to her students. She finds their strengths and helps develop their talent." San Bernardino, CA teacher: Susan M.
"Special thanks to a wonderful and talented teacher, Chris, on National Teacher's day!!" vatory in Boston, MA. It was these early lessons and exposure to my mother's innovative teaching style that ignited my love of music and enabled me to pursue a career as a professional cellist and teacher~ I am grateful for the many doors cello has opened in my life. My mother started the string program in the town I grew up in and within just a few years, a quarter of the entire school was enrolled in the string orchestra! She is a maverick teacher, absolutely one of the best!" d is a positive and creative teacher. She loves her students and tailors each lesson to the individual students' needs. I would highly recommend her." ry, and inspires disciplined practice at home. I absolutely love it!" "Omar was kind with my never had a lesson status said we should get started and had me making some nice sounds with the cello in no time at all"
experience we have had with Susan as our teacher. She is truly gifted!" Singers, Don't Forget These 9 Items In Your Gig Bag!